Never lose sight of what’s important. Thanks to the convenience of iSecurity+, available for iOS, Android, or through the Cloud Portal at zyxel.isecurityplus.com, you can check in on your camera from your phone or PC at any time. It’s the perfect way to keep an eye on the kids while you pop out to the store, or make sure Fluffy doesn’t eat the carpet while you’re at work. With revolutionary Pan-Tilt-Zoom technology, there won’t be a single corner of the room Fluffy can destroy without you knowing about it. The IPC-4605N is a revolutionary network camera designed to take the expense and confusion out of watching over the important things in your life. While traditional network camera setups are expensive and difficult to maintain, the IPC-4605N utilizes state-of-the-art cloud-based architecture to make installation and playback simple, with no complicated network setup required. With the IPC4605N, nothing will escape your sight, and your carpet will escape Fluffy. State of the art PTZ technology allows an unprecedented range of camera motion. Automatic night-vision provides crystal-clear vision even in complete darkness. iSecurity+ allows users to view, manage, and share their video feeds from any PC, Android or iOS device. Control your camera’s movement from any PC or smartphone with Cloud Control. 802.11n compatible for high-speed wireless connectivity in remote or difficult areas. The IPC-4605N harnesses the power of the cloud to free you from the constraints of a traditional IP camera. There’s no complicated maintenance or expensive equipment required, and setup is simple – just a few clicks in the included eaZy setup wizard and you’ll be ready to use your camera within minutes. The IPC-4605N is compatible with the iSecurity+ suite of mobile apps to provide fast, easy access to video feeds and camera management tools directly from any iOS or Android-based device, or from any computer with a Flash compatible web browser. With the IPC-4605N, everything’s illuminated. To ensure you’re able to check in on your video feeds 24/7, the IPC-4605N comes equipped with an array of IR LEDs that automatically light up to 10 meters to provide perfect vision even in total darkness. The IPC-4605N utilizes 802.11n wireless technology to make it easy to install your camera anywhere a Wi-Fi signal is available. Now it’s no problem to monitor parking lots, outdoor areas, or rooms that simply don’t have an available Ethernet connection, and there’s no need to worry about the cost or difficulty of running new wire. The IPC-4605N features state of the art technology to make sure you’ve always got an eye in the sky. Pan-Tilt-Zoom functionality lets you remotely control your camera in real-time; allowing you to quickly and easily pan your camera up to 340 degrees, tilt up to 100 degrees, or zoom up to 10x – all from any internet-connected PC, or from Android and iOS devices with the free iSecurity+ app. In addition, CloudEnabledTM technology makes it easy to view and manage multiple cameras from a single interface, with no network setup required. 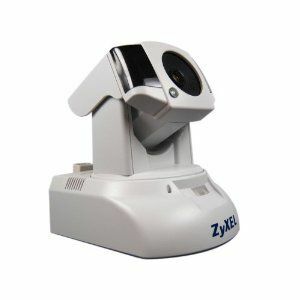 ZyXEL presents the first truly consumer-friendly IP camera. Designed with Cloud-based technology to eliminate the traditional difficulties inherent in network cameras, the IPC4605N provides superior functionality and accessibility for 24/7 peace of mind. The IPC4605N harnesses the power of the cloud to free you from the constraints of a traditional IP camera. There's no complicated network setup required and your video feeds can be viewed from any PC, iPhone, or Android device, anywhere in the world. 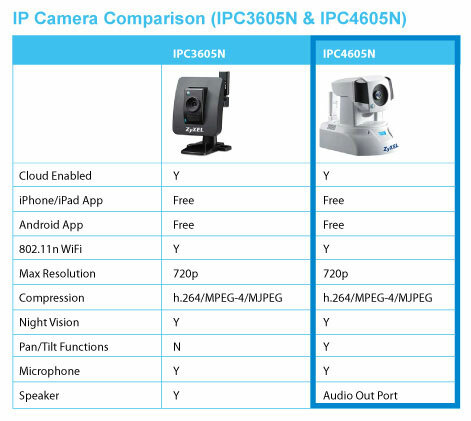 The IPC4605N is compatible with the iSecurity+ suite of mobile apps to provide fast, easy access to video feeds and camera management tools directly from any iOS or Android-based device, or from any computer with a Flash compatible web browser. The IPC4605N utilizes 802.11n wireless technology to enable easy installation anywhere a Wi-Fi signal is available - making it easy to monitor parking lots, outdoor areas, or rooms without a readily available Ethernet connection free from the cost and difficulty of running new wire. IPC4605N features state of the art technology to allow unparalleled surveillance in any conditions, 24/7. 720p video provides improved clarity over traditional 640x480 network cameras, while h.264 video encoding saves bandwidth without sacrificing video quality. For best-in-class surveillance even in low light conditions, an array of IR LEDs automatically illuminates dark areas, providing perfect vision at up to 15 feet even in total darkness.